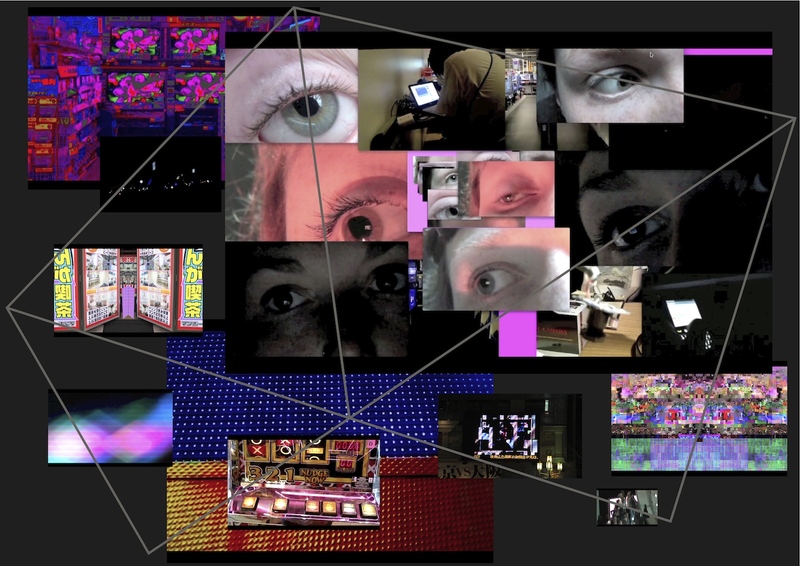 Multi Channel Video Installation with 11 moving image works. Accompanied by a limited edition poster and DVD. The ‘Constant Screen’ is a reflection on my own subjective response to information overload and excess – specifically through the vessel of the screen – and the constant distraction and pull into these shiny glowing surfaces. A large back projected screen displays a single channel video recorded using screencasting software directly from the surface of a computer screen. The software catches an unseen user’s movements dragging and overlapping various videos playing at the same time. The viewer can trace this through the movement of the mouse over the images, and the occasional instantly recognizable drop-down menu. The video contains multiple windows playing separate windows. Most of these smaller videos are of my eyes gazing at screens. Some are focused on a distortion in one of my pupils – a birth defect which effects how my eye processes light, included as a way of demonstrating a kind of natural glitch. Others show my eyes glinting in the dark as I watch unknown programs, yet others show various screens glowing – flat screen TVs in shops, laptops on desks and mobiles in someone’s hand. The overlaid videos also have overlaid audio – snippets break into audibility – some conversation, some operatic music, someone reading the news. 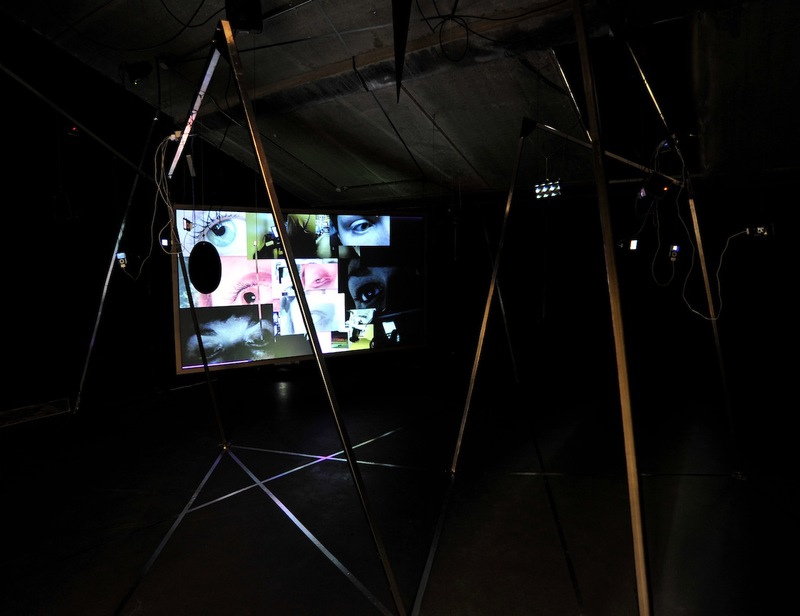 This video is called ‘The Distracted Gaze’ and forms the centerpiece of the installation. It is intended to engage the viewer but not to generate a sense of sacred contemplation, and in it’s repetitive use of footage to release the viewer to examine the 10 moving image works playing on various handheld devices like ipods. In front of this screen are 2 metal frames linked by a pattern across the floor tying the 3D elements into a bigger floor-based drawing. These respond to Larry Roberts early 1960s network drawings (see background image), made from observations of people walking through public space and used as studies for how to network multiple computers together. The structures and pattern on the floor form a kind of web – the is the network which we are all immersed and enmeshed within. From these metal structures and from various points in the slanted ceiling 11 small screens such as iPods are suspended by wires and cabling. Each of these smaller screens carries it’s own tiny video – tiny intricate glowing images. ‘Tokyo Billboard’ shows a animation of stills of an LED billboard images being refreshed. The superfast shutter speed captures the programmed turnover of images – the code beneath which the eye is too slow to capture. All are miniature musings and form a response to the seduction and horror of the screen.